Bamboos There are 3 products. Bamboo is a tribe of flowering perennial / evergreen plants in the grass family Poaceae, subfamily Bambusoideae, tribe Bambuseae. Giant bamboos are the largest members of the grass family. In bamboos, the internodal regions of the stem are hollow and the vascular bundles in the cross section are scattered throughout the stem instead of in a cylindrical arrangement. The dicotyledonous woody xylem is also absent. The absence of secondary growth wood causes the stems of monocots, even of palms and large bamboos, to be columnar rather than tapering. 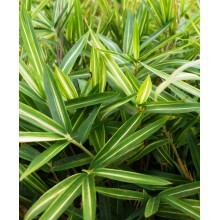 Bamboos are some of the fastest-growing plants in the world, due to a unique rhizome-dependent system. 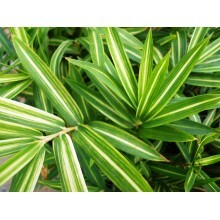 Pygmy bamboo is one of the smallest bamboos, and its leaves are also very small. It will quickly form a very nice carpet in the garden. 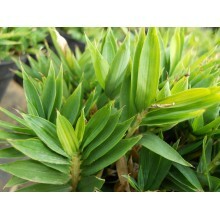 It is one of the best of the dwarf bamboos for use as a bonsai. This species is similar to Pleioblastus distichus, but its leaves do not display the fern-like leaf grouping.